Hello, and happy Friday - I can't believe another week has gone by. I have a card to share today that I made for the Timeless Tuesday Challenge at Flourishes. favorite Flourishes stamp, and a die. Flourishes "On the Porch" Stamp Set, Copic Markers, Scor-Buddy, Spellbinders Romantic Rectangles, Want to Scrap Bling, Prima Songbird Collection DP, Flourishes Classic White CS, Ivory Jute (Flourishes), Rust CS, Button from my stash. The book and pillow on the chair are paperpieced with some of the Prima DP's. Everything else is colored with Copics. The lower half was scored and sponged to resemble a hardwood porch. Hope you have a nice relaxing weekend planned! Thanks for stopping by, and thank you so much for all of the nice e-mails requesting updates on our DD, who lives in Col. Springs. So far, the fire seems to be staying a good distance from their apartment. The fire itself is 2-3 miles away, but the smoke and ash has been awful. It's literally 'rained' ashes on their porch, outdoor furniture, vehicles, etc. Please continue to think about and pray for the folks who have lost their homes, and have been evacuated. Hi there! Welcome to our 'What-If Wednesday' Repeat Impressions' Sketch Challenge. Today's sketch just HAD to be flipped. I've tried to behave myself lately, and not be a 'sketch flipper', but you know how it is...sometimes the temptation is just too great! 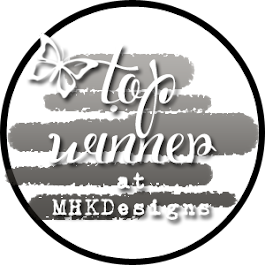 I hope that you will head over to the Repeat Impressions' Blog, The House That Stamps Built, for all of the challenge details, and that you will check out my fellow Rockstars' blogs to see their beautiful creations! We would love to see you participate in the challenge! Someone will win some great RI goodness!!! Edited: Please, please send up some good thoughts, and prayers for those in the 'line of fire' in Colorado Springs. As of 2:00 this morning, there were 32,000+ evacuated, many left knowing they have nothing to come home to. Our friend, Lee Murphy's daughter is one that was evacuated...so please pray for her! This photo was taken yesterday afternoon, from our daughter's apartment complex. If you look to the left, you can see the front of the apartment buildings. The fire is actually 1.5-2 miles away, and at least for now, she is safe, but it is very frightening. Certainly makes our tree in the photo below look silly. We appreciate your thoughts and prayers. The limb actually broke off and fell at an angle, missing the corner of the house by a mere inch, thank goodness! Also grateful that the man that mows for us was not mowing under the tree at the time - Yikes! Sigh...another Honey-Do for DH. Poor guy! Thanks so much for stopping by - love having you visit! Nap Time Fairy is today's Reapeat Impressions' Stamp of the Week. I thought she was adorable!...and again, a CAS card won out! I did not include a sentiment. I wasn't sure who might be the recipient of the card, or what the occasion might be. This sweet image can be purchased for 50% off this week at Repeat Impressions, exclusively to their blog readers, at The House That Stamps Built. 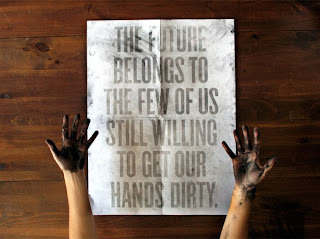 While you are at the blog, be sure to check out the challenges that you can still enter. 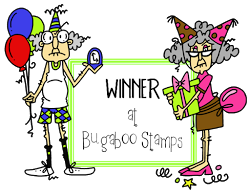 You need not use RI stamps, but we'd love to see them, and if you DO use them, you will get two chances to win wonderful stamps! It has been EONS since I've entered a challenge - am entering this card in the CAS 2000 Member Party Challenge at The Outlawz! You should go check out all of the fun they have this week! Have a great day, and a wonderful week! Hope that you are all enjoying your weekend. I have received 3 emails lately, asking me why I never post cards that have been published on my blog. Well, I can only say "duh". I just haven't thought to do so! So, without further ado, or jabber, here are the cards that were in the July issue of CardMaker. I am absolutely NOT a photograper, so when the submission call came out for photo cards, I was bummed. What to do, what to do? Then it hit me that our DD is a fabulous photographer! She has had some of her works published, and loves to take photos. The photo on these cards was taken by her. She's been lucky enough to have worked in both the Phipps and Brooklyn Botanical Gardens, where beautiful flowers are in abundance, and this was just one example. I had originally submitted the blue card, with the black and white photo, and the editors asked me to make a sepia, and a full color card as well, so that is what you see here. Enjoy your weekend, and thanks so much for stopping by! 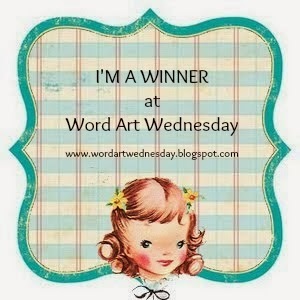 Thank you so much for all of your nice comments during our Stars and Stripes Blog Hop - I wish you could ALL be winners! The randomly chosen winner from my blog is: EVA-ESAGA! Congratulations Eva!!! Please e-mail Adela, and tell her which of the new templates you would like - your choices are the Border Box, or the Gourmet Take Out Box. Thank you so much for your visiting my blog, and for your nice comment! I hope you'll visit me again soon! It's All About the Stars & Stripes! Welcome to the Creations by AR Stars & Stripes Blog Hop! Hopefully, we will inspire you today, with our Patriotic theme, and also give you several chances to win one of Adela's fabulous new Creations by AR templates! We've decorated these templates today in patriotic colors, but think pink or blue for baby showers, shimmery colors for weddings...the possibilites are endless! Our first template is this fun Gourmet Take Out Box. The template comes in two sizes, a short and a taller box. I've chosen to work with the short box today. Next up is the Border Box. This great box comes with templates for a star border, a heart border, and a diamond border. And of course, if you don't want a border, you can simply cut your border off, and have a straigt edge at the top. Creations by AR Border Box with Stars, Doodle Pantry Patchwork Star and Digital Paper, Baker's Twine from Really Reasonable Ribbon, and centerpiece from Deal's. Last, I couldn't resist using the cute little Tres Chic box. It goes together so quickly, I just thought it deserved a spot on the page! So now, you have a centerpiece, a tray full of goodies to place in the center of each table, and a cute little take out box for individual favors. Your party is complete! 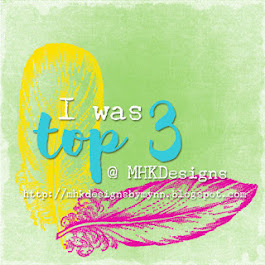 Visit each of the following blogs to see what my talented teammates have created. 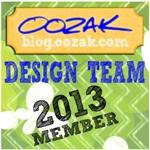 Leave a comment at each blog, and you will be automatically entered in the drawing to win one of the templates. If you comment at one blog, you have one chance, if you comment at all eight blogs, you have eight chances! 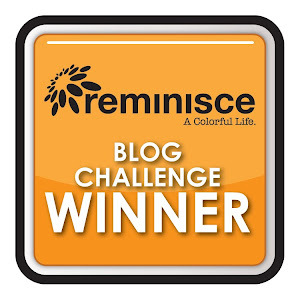 Revisit each blog on Saturday, June 23rd to see who the winners are! Thanks for hopping with us, and Good Luck! Repeat Impressions Stamps: 4503W Beach Time, 4320W Wild Daisies, 9003W Happy Summer, Tim Holtz Distress Inks, Post-It Note, Pearls from Michael's. I began by stamping the sweet image where I thought it should go. I stamped the image again on a post it note, and masked off the image on the main panel with the post it image. Then, using an old oval template that I created a long while back, I did some sponging layers with Tim Holtz Distress Inks. Dabbed on some 'sand' with a sponge and ink. Finished up by stamping a row of flowers, and a sentiment, and adding a few pearls from Michael's. Voila! Very, very fast and easy card! Please head over to the RI blog, The House That Stamps Built for all of the challenge details, and be sure to check out all of the beautiful creations that my fellow Rock Stars have made for you today! Hope you are all doing well. At my age, if I can get out of bed in the morning, my eyes open, and my feet work, I'm feeling pretty blessed! Thanks for stopping by, and have a great day! Thanks for stopping by - please stop back by tomorrow as I'll have a new challenge card for Repeat Impressions up tomorrow morning bright and early. Have a good evening. Flourishes posted a new challenge yesterday - a Noon-Time Challenge! The challenge is to "Pop It" - add some dimension to your projects by popping them up. I used two sets "Signs of Spring" and "I Love Roses" (lol...remember I only own two Flourishes sets, so I do a lot of improvising with them...) to make a gift tag. I am always in need of something to enclose with a gift to a chemo patient, or hang on a gift tag! This view shows the oval panel is popped up, and the rose is popped up. I stamped, colored, and cut out just the small center of the rose, and popped it up also. Lots of dimension in this wee tag! Hope you are enjoying your day. It's another pretty day here. Good morning, and happy Wednesday! Repeat Impressions 9203-P Daisies & Butterfly, 9206-H Beautiful Days, Memento Tuxedo Black Ink, Kaiser Craft Pearls, Copic Markers, Baker's Twine-Really Reasonable Ribbon. I stamped the 9203-P, Daisies & Butterfly, three times. 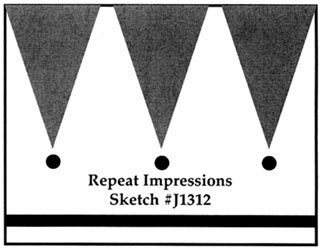 Then I made a clear template of the triangles, and cut out each of the three, being careful to let a different part of the image show in each one. Color (I edged the sides of the triangles with Copic Marker, as well), adhere, add some pearls and a sentiment, and voila! A CAS card! Please visit the Repeat Impressions blog, The House that Stamps Built for all of the challenge details. We would love to see your take on the challenge! Be sure to check out my fellow Rockstars to see what great creations they have for you today! Their links are on my sidebar!!! 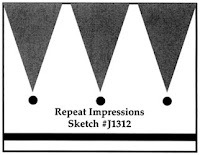 It's time for a new Stamp of the Week, at Repeat Impressions! Today's stamp is called Beaver (#4211-K). This adorable stamp is available exclusively to our blog readers at 50% off for a short time. Please check out the Repeat Impressions Blog, The House That Stamps Built, for all of the details! I stamped and colored only the leaves on the Kraft background, making my own DP :) The Beaver, leaves, and water are colored with Copic Markers, and the sky is sponged with Stormy Sky Distress Ink by Tim Holtz. Perfect Layers Tools were used for the great layers! A quick and easy card with a very simple sentiment (Repeat Impressions #9003-E, Happy Summer) to just let that someone special know you are thinking of them! 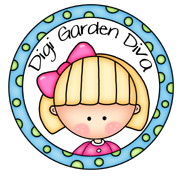 Please stop by my uber-talented teamies' blogs today, to see their wonderful creations! It never ceases to amaze me how four of us can use the same stamp, and it looks so different! Gotta love it! Good morning - hope you are all enjoying your weekend! Today's card is just for fun. I had made one like this a while back and liked it so much that I cased myself, and made another one! Yep, it's dots again - Amuse CS. I am actually entering a challenge with this one! Linda is the hostess at The Crafty Friends Challenge, and her challenge is to use flowers on our projects. Hope this cheerful creation brought a smile to your day. Now, off to get this in the mail to someone special! Have a great day! Thanks for stopping by! Gotta go put these in the mail - take care, and have a great weekend! It's a beautiful morning in Missouri - hope it's nice where you are! Short post today - lots to do :) Today's card is for the Timeless Tuesday #172 Challenge at Flourishes. The challenge hostess is Amanda, and she asked that we make a white card with lace and/or pearls. What fun, and such a perfect challenge, as I only have two sets of Flourishes stamps (which have been used over and over and over), and they happen to be floral themed sets. I'm hoping my doily will count for the 'lace'. Thanks so much for stopping by! I'll be 'pedaling' (hint, hint) back here on Saturday with a couple of extremely CAS cards that I cased from a friend....see you then! Bazzill Basics CS, Metallic CS from my LSS, Express It Blending CS, Copic Markers, Cuttlebug Embossing Folder, Repeat Impressions Harley (9210), Born to be Wild (9108), Wild Daisies (4320), Dimensional Foam, Perfect Layers Tools. We would love to see your take on this challenge - you do not need to use Repeat Impressions stamps to enter - just grab watever stamps are laying on your desk, and come join us! Please visit the RI blog, The House That Stamps Built for all of the details, and please check out my fellow Rockstars to see their amazing creations. Please continue to keep our member, Kecia, in your prayers. Her DH will hopefully have his surgery soon. Hello, and happy Monday to you all! 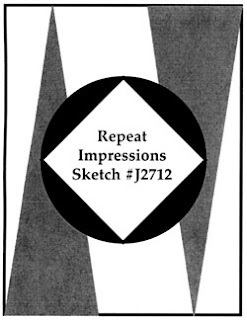 As it is Monday, it's time for another Stamp of the Week at Repeat Impressions. Today's SOTW is "Iris Window" #919-I. I decided to make a pretty simple card, as my time was spread pretty thin this weekend. My Perfect Layers Tools helped me to have...yup! Perfect Layers! I think this one turned out very simple, but pretty. You can find this stamp as well as the sentiment, at Repeat Impressions. Please stop by the RI blog now, The House That Stamps Built to see what the other RI Rock Stars have created with this beautiful stamp! I have a quick card to share today - it's one of those 'just for fun' cards. I saw this stamp set from Art Impressions, at the Archiver's in Colorado, and had to have it. It was so much fun giving this 'handsome man' a little sunburn! Check out his nose, neck, arms, and legs. You know what I'm talkin' about - I know you do! These dudes go out in the sun the very first time of the season in all of their bareness, and wonder why they've gotten sunburned...tee hee...lol! My Perfect Layers Tools were used on this card for the great layering. You can check them out here! Take care, and have a great evening.